Rules: The game will be an official 40-minute game (two 20-min halves), using standard 2014-15 NFHS rules. A two-man Washington County Basketball Officials Assc team will be used. 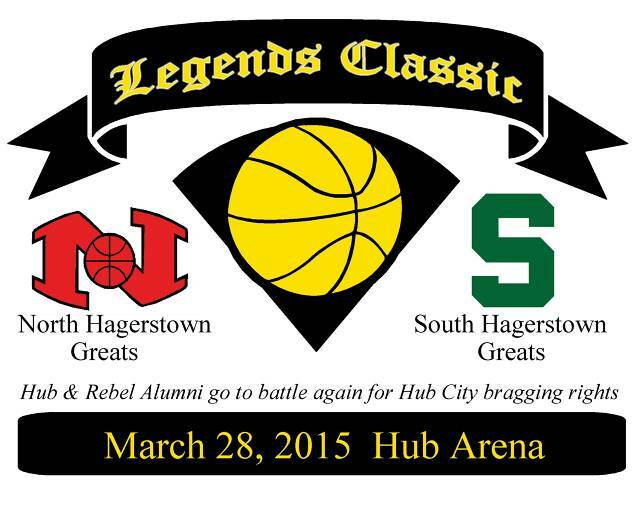 Info: The first-ever Legends Classic game will pit the North Hagerstown Hub greats vs. the South Hagerstown Rebel greats for Hub City bragging rights! A MVP plaque will be awarded to the game's top player. A few weeks prior to the game, all participating players will be invited to Event Media day at the Hagerstown Buffalo Wild Wings on Sunday, March 1, 2015. Players will have their photos taken and fill out some info for the event media guide and may be interviewed by the Herald-Mail newspaper, WHAG-TV and Inside Sports. Costs: The only cost required to participating players will be a $10 fee for the official game shirt with a number. North will wear red and South will wear green. All players must wear black shorts for the event. The participation fee can be paid on the website (in February) or at Media Day on March 1. If your fee is not paid, you will not receive a shirt and will not be able to participate.